We give an overview of some new trends in preference modeling, utility representation, and choice rationalization. Several recent contributions on these topics point in the same direction: the use of multiple tools—may they be binary relations, utility functions, or rationales explaining a choice behavior—in place of a single one, in order to more faithfully model economic phenomena. In this stream of research, the two traditional tenets of economic rationality, completeness and transitivity, are partially (and naturally) given up. Here we describe some recent approaches of this kind, namely: (1) utility representations having multiple orderings as a codomain, (2) multi-utility and modal utility representations, (3) a finer classifications of preference structures and forms of choice rationalizability by means of generalized Ferrers properties, (4) a descriptive characterization of all semiorders in terms of shifted types of lexicographic products, (5) bi-preference structures, and, in particular, necessary and possible preferences, (6) simultaneous and sequential multi-rationalizations of choices, and (7) multiple, iterated, and hierarchical resolutions of choice spaces. 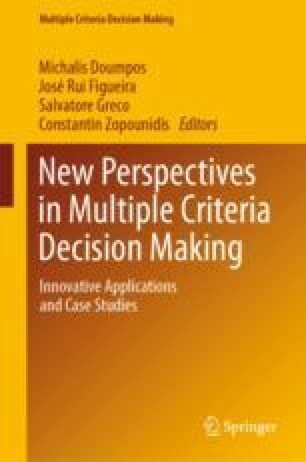 As multiple criteria decision analysis provides broader models to better fit reality, so does a multi-approach to preference, utility, and choice. The overall goal of this survey is to suggest the naturalness of this general setting, as well as its advantages over the classical mono-approach. The author is very grateful to José Carlos R. Alcantud, Domenico Cantone, Jean-Paul Doignon, and Stephen Watson for several fruitful suggestions and discussions. This section contains two figures, which summarize some results of this survey. Figure 6 describes all implications between combinations of weak (m, n)-Ferrers properties. For instance, the arrow from the box (3, 2) (i.e., strong interval orders) to the the box (3, 1) and (2, 2) (i.e., semiorders) says that any strong interval order is a semiorder, but the vice versa is false in general. Notice that the very last segment of the picture—that is, going from a total quasi-preorder to a simple preference—can be refined into an infinite hierarchy by using strict (m, 1)-Ferrers properties. For any integer \(n \ge 3\), determine the number of pairwise non-isomorphic (either all or normalized) NaP-preferences on an n-element set. Notice that, in the special case of NaP-preferences having a semiorder as a possible component, the above problem is related to a possible generalization of the Catalan number (Stanley 1999). Cantone, D., Giarlotta, A., & Watson, S. (2018b). Congruence relations on a choice space. Social Choice and Welfare (forthcoming). https://doi.org/10.1007/s00355-018-1146-0.